Biologists are conducting a statewide study of black bear reproduction. WORKING FOR THE DWR can be pretty exciting sometimes. I’ve had the opportunity to participate in an activity most employees would love to do just once — and I got to do it twice! My adventure began about a year ago, in March 2010. I’d heard tales from previous years, and I knew the season for bear denning was upon us. Biologist Justin Dolling snapped this photo when checking a den in northern Utah. During the physical examination of the female bear, the biologists estimate her weight, assess her overall condition and ensure that the GPS collar fits properly. My good friends, Katie and Dale (who both work in one of our regional offices), dropped by one afternoon to say hello. I wasted no time asking about the upcoming bear trek. They were kind enough to help me get on the short list of folks who were heading out in search of a bear den. For a small-town girl from Mississippi, this was a chance of a lifetime! Before I tell the story of our trip, I should probably explain why we’re looking for bear dens. Our wildlife biologists are in the middle of a multi-year study to learn more about black bear reproduction. We’ve placed GPS collars on adult female bears across the state to see how often they reproduce and to learn how many of their cubs survive. In February and March, the biologists follow signals from the collars to find the bears’ dens. We tranquilize the adult female and any one-year-old bears she has with her. Then, we check the bears’ health and gather biological data. If the female has newborn cubs, we do not tranquilize them. We do a quick check, while keeping the cubs warm, and then return them to their mother. In early 2010, the study data indicated that around 90 percent of yearling cubs survived the winter. Now back to my story. Excitement doesn’t even begin to cover the way I felt when we headed out on that bright Monday morning. The first part of the trip required a ride on a snowmobile. This was my first time on a snowmobile, and I must say, it was a total blast. (It reminded me of riding a wave runner in the Gulf of Mexico but colder and with fewer waves.) After the snowmobile ride, we began the hike. This cub was returned to its mother after biologists made sure her GPS collar wasn't too tight. The main purpose of this study is to track bear reproduction and cub survival from year to year. At the time, I thought it was a really tough hike. This was my first time on snowshoes, and it was quite a challenge figuring out how to maneuver them and stay on my feet. Up, down and along narrow hillsides we trekked, all the way to a rocky outcropping on the side of the mountain. This was it: my first glimpse of a real, live, wild bear — or so I thought. 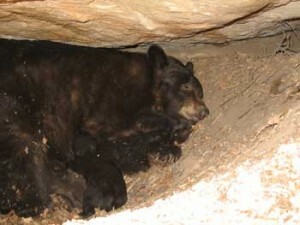 Unfortunately, the den was positioned in such a way that the biologists were unable to get the bear out. They tried and tried but to no avail. So, our team of disappointed hikers made its way down the mountain. It was a wonderful day of hiking, and the views were unbelievable, but I didn’t get to see a bear. This was now my only mission in life: to see a bear. The next day, I learned about an upcoming Friday bear-denning trip. I’m not one to sit around and wait for an invitation for something that amazing, so I found out who I needed to talk to. Justin and Kevin, who just happen to work in my office, were gracious enough to allow me to tag along. How lucky could one girl be? Two bear trips in a week. I was beyond ecstatic! This time, I would see a bear — or so I hoped. Friday came, and our group met up to begin the hike. Hobble Creek Canyon was our destination. We took snowmobiles up the canyon as far as we could go. It was a beautiful sunny day, but the ride was cold. Then, we strapped on our snowshoes (by this time I was an old pro) and headed up… and up…and up. I thought I was going to die! Monday’s hike was nothing compared to this. It was tough, but oh, was it worth it. After our three-hour hike up the mountain (straight up in some sections), we found ourselves patiently waiting for the team to administer the tranquilizer drug to the bear. It took about 20 minutes for the drug to take effect. When the coast was clear, we made our way over to the den. To our surprise, the mother had two newborn cubs with her. I was excited enough just to see a bear, but now there were cubs. It was unbelievable! Do you remember the best day you ever had at work? Here's a peek at one of mine! Kevin allowed each of us to peek into the den. It was nice and warm inside, and the cubs were making little cooing noises. Once everyone had looked inside, he pulled the cubs out for us to hold. It was amazing. They were so warm and soft. We were instructed to keep them close to us and under our jackets to keep them warm. No one had trouble with those instructions. They had bright pink noses and long sharp claws. I think the size of those claws is what surprised me the most. They were very long for such a small animal, but we all know they only stay small for a short period of time. 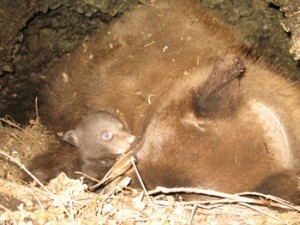 After the biologists finished gathering data from the mother bear, they returned the cubs to the den. They covered the den with pine branches and snow to make it cozy and snug again. Then, we began to make our way down the mountain, sometimes walking, sometimes falling, and sometimes sliding as fast as we could. It only took about an hour to get back to the snowmobiles. I think everyone in the group was on cloud nine by this point — I know I sure was. 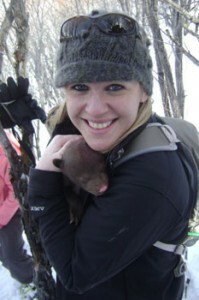 The day was long and the hiking was tough, but nothing can compare to cuddling a bear cub. That trip was one of the most incredible experiences of my life and one I will never forget. Utah has amazing animals! I feel very fortunate to live here and to work for an organization that allows me to experience such unforgettable moments with wildlife. << (Previous) Is that deer wearing a collar? Loved, loved, loved, the article by Patricia Engle!!!!! Loved the article on bear denning – so glad you are taking care of our wild animals! You are awesome! I love the work you do and Utah is a better state cus of it! Wow- the baby bears are so cute. but can’t imagine meeting a real grown bear though. Its great to see someone enjoying their job and helping to protect th environment.